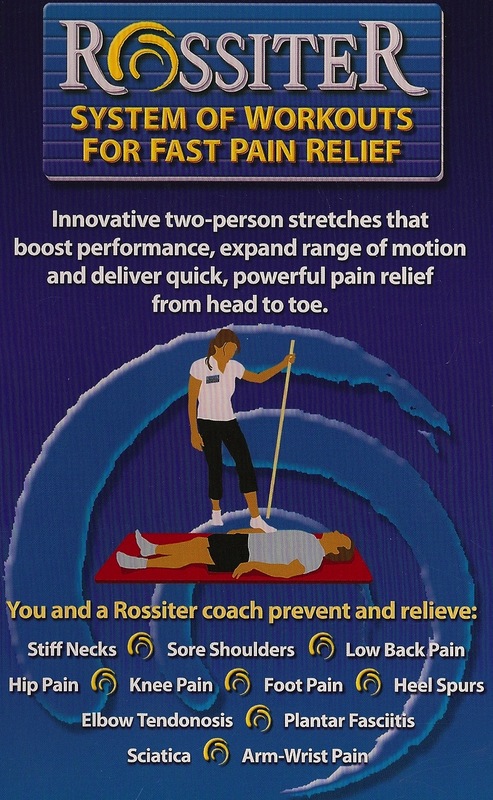 "When I first learned about Rossiter, I had been having pain and tightness in my leg that prevented me from sitting cross-legged for the past year or so. After a 5 minute demonstration, one stretch, there was such a feeling of lightness and ease in my leg. I felt at least 70% better! I attended the training to become a coach over the summer and after doing the workouts, I can now sit cross-legged with zero pain." I texted a client a day after a workout on her knee, to ask her how it was feeling. The response... "I'm snowboarding right now!" "When I went skiing, I kept waiting for my knee to begin hurting again. It never did!" After the first workout: "The pain in the leg, it is not completely gone but incredibly less. I started noticing it as I walk, I'm not limping as much. I really want to thank you because I am just blown away! " "Due to elbow pain, I was unable to play the clarinet for at least a year. After 2 sessions of Rossiter, and I have to say I was very sore the day after the second session, but then the next day the pain was gone, and its gone for good! I'm playing the clarinet again!" "Though I've felt the benefits of massage for decades, Ellie's efforts over the past year have substantially raised my perception of what can be achieved. Ellie has an exceptional ability to "lock on" to problem areas and then to appropriately adjust to how they respond. She listens acutely to bodily responses--without my verbal feedback. Whereas most massage therapists could be characterized as offering a relatively narrow therapy somewhere between pain-inducing manipulations and relaxing stress-relief, Ellie is more able than most to dynamically adjust her technique during a single session. Whether she is applying focussed pressure to a trigger point or directing energy flow with a light touch, she does what's best--with no words from me! Ellie has excellent practical advice for my ache or pain complaints. Even better, by listening in on the silent "conversation" between (my) muscles and Ellie, I have become a better listener (to my muscles) and so have improved how I take care of myself! That's the way I see it." "Ellie expertly combines classic swedish massage with deep tissue techniques to intuitively provide exactly what I need!"